This new dietary supplement fight against the damaging effects of allergies. It contains Lactobacillus salivarius LA 302 (4000000000), the onion extract (50 mg quercetin) and rosemary extract (50 mg of rosmarinic acid). Rosemary contributes to normal functioning of the immune system. 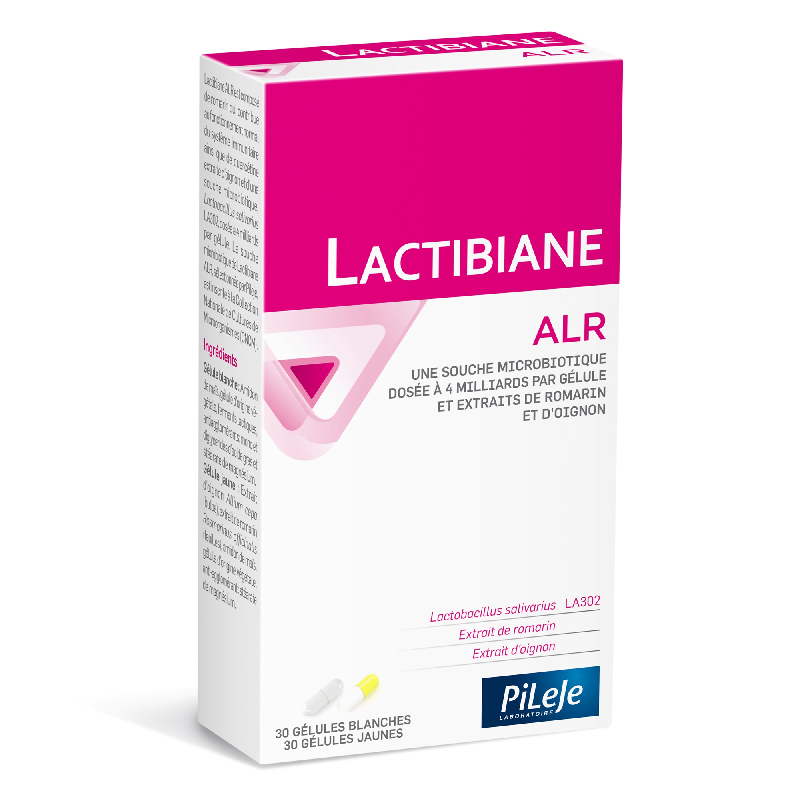 Lactibiane ALR is formulated to promote proper functioning of the immune system. It effectively fights against bothersome allergy symptoms. This new dietary supplement containing Lactobacillus salivarius LA 302 (4000000000), the onion extract (50 mg quercetin) and rosemary extract (50 mg of rosmarinic acid). Rosemary contributes to normal functioning of the immune system in allergic. Lactibiane ALR, contributing to the proper functioning of the immune system, can significantly reduce itchy eyes and nose as well as watery eyes associated with allergic disorders. 2 capsules daily (1 capsule white and yellow capsule). capsules should be swallowed with a glass of water, preferably before a meal. Length of treatment of lactibiane ALR: 1 month. Recommended to fight against allergies. A) Clinical studies in patients with allergic rhinitis said. 1 Osakabe et al, 2004: rosmarinic acid 50 mg versus placebo.. for 21 days. Significant reduction of itching eyes and nose as well as watery eyes was observed in the group rosmarinic acid 50mg. 3 Sanboni et al, 2003:.. Oral administration of rosmarinic acid. Inhibition of pulmonary lesions and inflammation induced by diesel exhaust particles. Decrease the release of histamine and pro-inflammatory cytokines from mast cells and basophils. Decrease in airway resistance, the histamine production and leukocyte recruitment. Decrease in the number of eosinophils in the bronchoalveolar fluid, blood and lung parenchyma. 4 Park et al, 2009:.. Mice, at a daily dose of 8-16 mg / kg after intraperitoneal administration. Decreased secretion of pro-inflammatory cytokines IL-4 and IL-5.